Roll dice to build a route across the USA. All players share the same rolls. Your choices make the difference. Great 1p, 4p, 12p+. 3,230 backers pledged $104,758 to help bring this project to life. 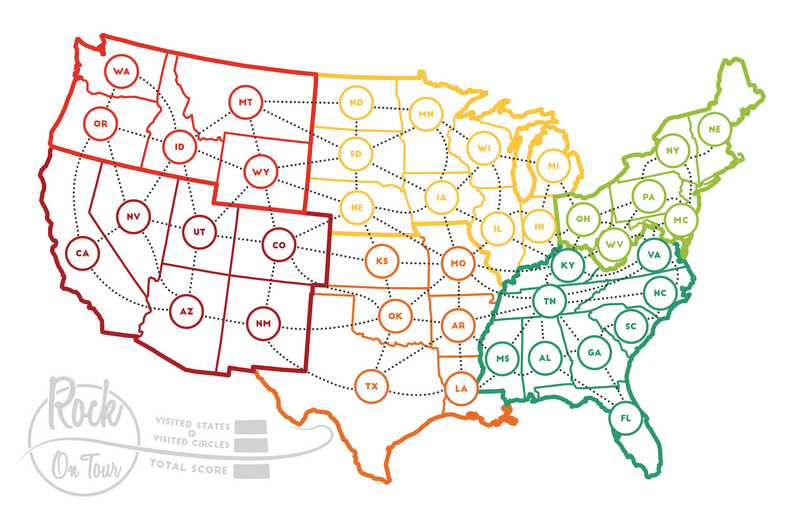 Once you have a number in every state, you'll draw a route through as many states as possible to see who wins. Your route must start in a state with a low number and then go to higher and higher numbers. There are also wilds, opportunities for bonus points, and a variable setup phase to make every game different. Watch the Man vs Meeple 5min video below to learn all the rules. You could even try to get a few thousand people together and set a world record. Just make sure you have a map for everyone. If you want additional maps and dry erase markers, they are $3 each (as in $3 gets you 1 map and 1 marker). Free shipping. I mean, seriously. We're going to put them in the same box. I don't think we need to charge for that. Or just pledge at the $48 pledge level, which is the base game plus 8 extra maps (12 maps and 12 dry erase markers total). Big (15.2" x 9.8" / 38.5 x 25 cm) tri-panel boards, with tape reinforced folds. Each player board in On Tour has unique art, each representing a different genre of music. The "Rock" map is shown here. The artwork for the country map was reveled in update #3. And we will reveal the artwork for the "Hip Hop" map later in the campaign. Then we will hold a vote among the backers to decide what music genre should be represented on the fourth map. Leave your ideas in the comments. Right now it looks like Jazz and Electronica/EDM are leading the way. You can write your number in any state in the region on the card, but if you write your number in the exact state listed, you get to circle that number. Circled states in your route are worth double points at the end of the game. How far out of your way should you go to visit a circled state? Should you write a number where you want to, or is it worth the risk to write it a little farther away so you can circle it? Games are great. New games are great. Learning games from the rules is a pain. We're trying to improve this situation. We used tons of giant pictures because it is easier to look at a picture than reading a thousand words. We took feedback from over 100 people on the rulebook's clarity, and will continue to make improvements based on feedback during this campaign. The On Tour box is specifically designed so that it isn't too big with 4 player boards, but you can expand the game with 8 more player boards (making it a 12 player game) and still fit everything in the box. Yes. The cards will still fit if you sleeve them. These stretch goals will be applied to all copies of the game at all pledge levels and for all extra player maps purchased (for those goals that apply to the map). $45K: Hall of Fame Sheet. Keep a record of the best tours of all-time. Record every winner's band name, player, and score to compare against future games. $50K: Companion App. An Android/iPhone app that will flip the cards and roll the dice for you. You will still use the dry erase player board and marker. Handy if you want to play a solo game on an airplane, or on your couch. $75K: Full Game App. Play solo games of On Tour in the Android or iOS app. This will be a paid app, but backers will get it for free. This is the last stretch goal. At this point I feel like the physical game is the absolute best it can be, and that adding anything more would only jeopardize the schedule. ALL STRECH GOALS FUNDED. THANKS EVERYONE. Please note that all these videos show prototype components, not the final quality. Tom also recorded a full play through, you can watch it here. The Dice Tower, Tantrum House, and Man vs Meeple were all paid for their preview videos. I had no say in the content of the video, but it is impossible to say how paying them for their time affected what they chose to say. The purpose of these paid videos is to give you an overview of the game from several points of view so you can make your own decision on whether or not the game is right for you. I've talked a lot about components and art. But those are all meaningless if the game isn't interesting and fun. Before we did any of that component stuff, we put On Tour through the wringer to make the game play great. July - October 2017 From idea to game: The game went through many iterations early. Eventually I got stuck. The game was good, but I knew it wasn't all it could be. Oct - Nov 2017 From "ok" to "really good": Waitress Games is a professional game development studio. They took the core game that was working, looked at it with fresh eyes, and then started playtesting new twists and new ideas. Dec 2017 - Mar 2018 From "really good" to "polished and complete": I started a whole new round of final refinement, which involved sending the game to people on BoardGameGeek that I'd never met and letting them learn from the rules. The game uses simultaneous turns, which is a great plus in my opinion as there is little downtime when playing multiplayer. The evolution of tactics within one play is really nice. At the beginning, there is a lot of long term planification, mid-game is more about pushing your luck, and end-game shines at damage mitigation based on beforehand planification. Overall, continuous adaptation is needed in order to get the most out of the game. Ok. So I have just played my first game and jumped straight in playing it solo. How naive I was. No regard for any strategy to this and close toward filling all the boxes in I realized I had blocked any decent route possible and gave up mentally, tipping the table over in self frustration. At least I have learnt how not to play. Stick the kettle on, reset the map. Let’s take a different approach to this. On Tour has a simple design but very deceptive. It invites you in with many options but without strategy and those number of options dwindling as the game nears the end, you will feel this game wasn’t as simple as first thought. The pace of the game is quick but requires thought and calculation to achieve a tour worth talking about. Without a doubt I will be playing this game again and will be bringing this to show at game nights for my friends. I will have to pre advise them not to underestimate it. I realized this game is actually more strategic than I previously imagined, and each game is completely different because the starting numbers and positions are completely different. This would make an incredible one player game. I like roll-and-writes and I liked this one too. It's easy to explain, quick to play and I enjoyed the careful planning when placing the numbers each round. The doubles rule works well and can come in handy if they're rolled late in the game to connect routes. The four initial state cards make the game more interesting. Please note this timeline is just an estimate. We have tried to make it conservative but realistic. But these dates are not guaranteed. This is the timeline for US shipments. Expect shipments to other parts of the world to be a few weeks behind this. During this Kickstarter Campaign I'm going to be sharing a daily podcast. Each episode will be short (< 10 min). Over the course of the month, you'll get to hear the On Tour backstory and topics like: how the game came to be, design problems that we ran into, why I wanted to make a game in the first place, art directions that we followed or didn't follow, and the decisions we made that made On Tour the game that it is today. However, the price will be a little higher than it is during this campaign. That is the only fair way to treat those of you who help make this project possible by paying in advance. The game won't be sold via traditional distribution, so if your friendly local game store wants to sell it, they will need to get a case from us (back at the $2 Retailer Pledge level during the campaign, or email help@boardgametables.com after the campaign). We will be happy to work with them. Shipping charges will be charged in our pledge manager after Kickstarter. Shipping will be $5 ($20 for the 8 pack of games). The game will be shipped from the USA, so there will be no additional customs or tax charges. Shipping will be $10 ($30 for the 8 pack of games). You will also be charged sales tax/VAT in the pledge manager after the campaign. Your game will ship to you from within CAN/EU, so you will owe no additional customs or taxes when you receive the game. This campaign has CAN and EU friendly shipping. We have decided to partner with a fulfillment center in Australia to offer Australian friendly shipping. Shipping for 1 game will be $20 in Australia and $30 in New Zealand. I don't have a price on the 8-pack yet. Shipping is $15. We won't charge you VAT, but you might have to pay duty when you receive your game. UK is being considered EU for this campaign. Shipped from the US. $45. You are responsible for any duty. Shipping to South Korea, Hong Kong, China, Singapore, Malaysia, South Africa, and probably most other counties in Africa and Asia. $38. Will ship from Germany. You are responsible for any duty. 8-pack shipping will be $69. We all have regrets in life. Backing On Tour won't be one of them. If you regret buying the game, we will give you a full refund and pay to have it shipped back to us. No questions asked. Actually, we might ask a question or two, but we will refund regardless of how you answer them. Chad DeShon is the designer of On Tour. Chad has been playing hobby board games for 14 years since discovering Catan in college. In 2014 he founded BoardGameTables.com. He likes heavy games like Age of Steam, Napoleon's Triumph, and Die Macher, and easier to learn games that have surprising depth like Haggis and Konig von Siam. Anca Gavril is the artist and graphic designer for On Tour. She loves playing games that come in white boxes, like T.I.M.E. Stories and Food Chain Magnate or at least with white text, like Pandemic Legacy and Blood Rage. If neither of these conditions is met, she enjoys fighting monsters and looting treasures around Gloomhaven. Katy Adams is the head of customer support at BoardGameTables.com and for this project. She likes Castles of Mad King Ludwig, Terra Mystica, Scythe, and worker placement games. This is the first board game we've published, but we have run one other Kickstarter. A year and a half ago, we ran a Kickstarter for a gaming table called The Duchess. It raised $2.6 million. It was a very ambitious project. We had significant problems. Many tables were damaged during shipment. We had production problems that caused delays. I expect fulfilling this Kickstarter to be much smoother. The game play is already final. The art is 80% done. We are working with Panda Game Manufacturing, a leader in the game printing industry. The art is 80% done. The game play has been tested. We are using Panda Game Manufacturing, who is a proven leader in board game manufacturing. I have been talking to my rep (hi, Joe) for months to make sure everything is lined up and on budget. I believe we have accounted for enough time to finish the art (4 weeks after the end of the campaign), but if we underestimated that, then it could lead to delays. Panda provided a range for how long each step will take, and we have based our timeline on the longest estimate in the range they provided. A miscommunication between me and Panda that leads to us having to redo one of the steps of the production process is another possible cause of delay. Production-wise, this game isn't that complicated. I have seen sample (non-printed) player maps from Panda, but I haven't seen samples with the tape reenforced seam. I don't anticipate any problems there, but I haven't seen them in person. We will also be working with Panda to make sure we are getting dry erase markers that will last and the best possible dry erase surface on the player maps. Pledge here if you want to hang out but aren't ready to go all-in yet. Retailers, pledge here for information about how you can buy cases of On Tour to sell in your brick and mortar store. Everything you need to play, including beautiful tri-panel player maps, dice, and dry erase markers for four players. Additional maps and markers to expand to more players available in the pledge manager after the campaign ($3 each). US: $5, CAN/EU: 10USD, Other: ask. VAT for non-US countries charged in pledge manager after campaign. You may purchase additional games, just adjust the dollar amount of your pledge accordingly. Everything you need to play, including beautiful tri-panel player maps, dice, and dry erase markers for twelve players. 8 copies of On Tour shipped to one address. Save on the games and save on shipping. US: $20, CAN/EU: 30USD, Other: ask. You may purchase additional cases, just adjust the dollar amount of your pledge accordingly.